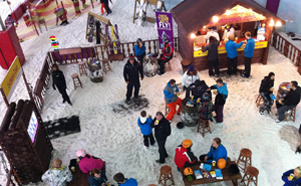 Agency Flourish is working with Monarch airlines to bring the après ski experience to ski centres in the UK. The airline is touring the centres with its authentic ‘ski boot’ bar where revelers can enjoy a tasty Gluhwein or hot chocolate just as if they were in the Alps. The Schuss Bar aims to show potential customers the wide range of services available on board a Monarch flight, via cups, cushions and stickers on the drag lift, and highlight its new routes to ski resorts. Britain’s number one female skier Chemmy Alcott is the brand ambassador for Monarch’s new ski routes, and has already attended events at Manchester Chill Factor, and will be at Castleford’s SNO!zone today (5 Sept). The tour will culminate in a four-day stint at Hemel Hempstead’s Snow Centre from 8-11 September. Catherine Smee, Flourish’s project director, said: "We’re delighted to be working with Monarch again. They needed a concept that would get their audience excited about their next skiing holiday, and the Schuss Bar is the perfect way to really fire up their imaginations."